One of the cool things about iOS instruments is that you can play them directly from the device’s touchscreen. The great majority of iOS instrument apps — pianos, organs, synthesizers, and so forth — feature onscreen, piano-style keyboards. Although the touchscreen keyboard isn’t the most efficient way to play such instruments, it gives you instant access to their sounds, without needing any additional hardware, unlike most Mac- or PC-based software instruments. Although playing from the touchscreen is convenient and fun, a keyboard player of almost any skill level will find it pretty restrictive. The built-in, onscreen keyboards on instrument apps can fit only one or two octaves of playable-size keys at a time, which makes them virtually impossible to use for two-handed parts. To help mitigate this problem, onscreen keyboards let you change octaves as you’re playing. Sometimes you can change octaves by pressing an arrow on the keyboard, and sometimes you can just scroll from octave to octave by flicking the keyboard with your finger. 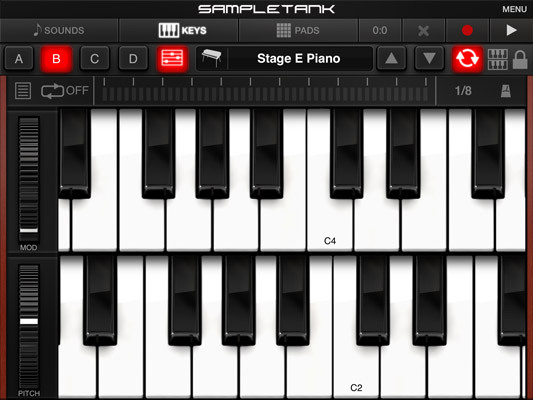 In addition, some apps — such as, for example, IK Multimedia’s SampleTank, a sample-playback groove-creation app — offer a double manual, which is keyboard jargon for one keyboard placed above another. This way, one can be assigned to bass notes and the other for the melody or chords of a two-handed part. You can even find apps that arrange the keys for use by two people at the same time — fun at parties! Where the touchscreen really shines, though, is for instruments whose interfaces are designed specifically for your iPad or iPhone or iPod touch — that is, instruments that don’t use the piano-keyboard paradigm, such as Wizdom Music’s MorphWiz or Audanika’s free SoundPrism app. These apps have unique user interfaces that are totally unlike piano keyboards. MorphWiz, for example, works similarly to the instrument it’s based on, an alternate MIDI controller called the Hakken Continuum, which you play by sliding your finger across the playing surface. 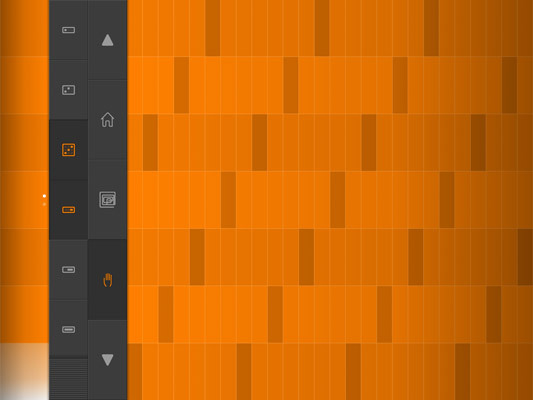 Each space on SoundPrism’s grid can produce either a note or a chord. Sliding your finger vertically gives you different inversions of the chord, horizontally moves pitch up or down, and your left hand plays a vertical row of bass notes.